This is an utterly intriguing issue, in the sense that it’s a historical document of some importance, containing as it does performances directed by the composer; but equally because we have here a number of items that are hard to come across on disc. Indeed, I couldn’t trace any other recordings of ‘L’homme et son désir’. If the recordings seem familiar it's because this set is a reissue of VoxBox CDX 5109. The group of composers identified by the journalist Henri Collet in 1920 as Les Six are the very personification of 1920s Paris, and Darius Milhaud was at their heart. Though his later music is calmer, more reflective, he never lost that ‘edge’, and never, ever, indulged in sentimentality or emotional soul-searching. That is where he crucially differs from Francis Poulenc, with whom he otherwise had so much in common. I find French music of this era entirely irresistible, so I was a push-over for these discs. But there’s no question that there are great riches here. 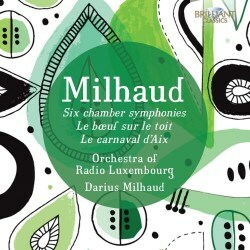 The first six tracks are devoted to the ‘Chamber Symphonies’ Milhaud composed between 1917 and 1923, the first while he was living in Rio de Janeiro as assistant to the diplomat/poet Paul Claudel, the second on the boat home to France in 1918, and the others at various points and places thereafter. These are true ‘little symphonies’: pieces in a number of sections; but they are extremely short, none reaching even seven minutes’ duration. The first three are scored for strings and woodwind, the fourth for ten string instruments, the fifth for a dectet (‘Dixtuor’) of woodwind, and the sixth for oboe, cello and a quartet of wordless solo voices. I found them delightful, quirky and invigorating. They breathe the true spirit of Les Six, especially in these fresh and stylish performances directed by the composer. The influence of Stravinsky is there; but it is the Stravinsky we recognise from the quieter moments of Le Sacre, in particular the introductions to parts one and two, with their organically proliferating counterpoint and instrumentation. Chamber Symphony no.6 segues very nicely into L’homme et son désir for, again, wordless solo vocal quartet. The instrumental forces are here, however, relatively large, with a particularly full and active percussion section which drives the music forward for quite long stretches. This ballet (or poème plastique as it was apparently first referred to) was another piece conceived in Brazil, and inspired by a visit there by Diaghilev and his Ballets Russes. This was an era when composers were truly waking up for the first time to the potential of percussion instruments, and Milhaud asks for a dizzying array, as the very useful booklet notes tell us; there are the familiar instruments, plus tambour Basque, tambour provençal, sleighbells, whip, whistle, wind machine, both wooden and metal castanets, and a plank struck by a hammer. This last may have been suggested by Mahler’s 6th Symphony, when something of the sort is called for in the finale – though it is hard, if not impossible, to think of two composers with less in common than Mahler and Milhaud. What is of greater significance is that, exactly contemporaneously with this work, Edgard Varèse was composing his first masterpiece, Amériques, with its revolutionary use of percussion. To be fair, Milhaud’s writing for them is much less imaginative; but it does give L’homme et son désir its unique and rather wonderful sound-world. The Second Piano Concerto comes from much later, and was first performed by Milhaud with the Chicago Symphony Orchestra in 1941. It is a thoroughly entertaining piece, with an especially endearing middle movement. The notes tell us that Milhaud confesses in his autobiography that the orchestra manager commented afterwards that “some of the passages…..were beyond me”. How many performers, let alone composers playing their own music, would quote or even admit that? It points to Milhaud’s unpretentious modesty, which is a quality that comes out strongly in the music. The Suite Cisalpine was composed for a true virtuoso, the great cellist Gregor Piatigorsky. The title refers to music from ‘across the Alps’, and is full of breezy folk songs and infectious dance rhythms. The soloist here, Thomas Blees, does a wonderful job, capturing both the vigour and the gentle lyricism of the demanding solo part. The second disc begins with one of Milhaud’s best-known works, the glorious, infuriating, catchy, ear-worm-inducing Bœuf sur le toit. Latin-American music is the obvious topic here; but the ingenuous dance melodies are gleefully subverted by bitonality and cheeky orchestration - and that maddening guiro. This performance is not especially polished, but that’s not a problem; the spirit is right, and it’s pure Cachaça, not Caipirinha! The Concerto for Percussion and Chamber Orchestra of 1930 is quite a dramatic, terse work, which once again evinces Milhaud’s interest in this section of the orchestra. Very enlightening is Milhaud’s comment that he specifically avoided any jazz influence in this piece; he’s paid his tribute to jazz in La création du monde, and clearly already saw jazz as a bit passé - with which some jazz purists would agree. The Viola Concerto, written for Paul Hindemith no less, is recorded here in its revised version for small orchestra, as suggested by Hindemith after the première of the original version. Another delightful work, it appears to have three movements, going by the listing in the booklet. However, the composer, in his note, states that it has four movements; I’m inclined to believe him - Brilliant Classics please note. Two piano works complete this disc; the first a collection of pieces with the captivating title La muse ménagère, which translates as ‘The Household Muse’. It consists of fifteen short movements with titles that indicate that even Great Composers have to do the housework sometimes; Milhaud was a very happy family man – perhaps that’s why. So we have Le reveil (Getting Up), Les soins du ménage (Housework), La cuisine (The Kitchen, or Cookery), Les fleurs dans la maison (Flowers for the House), La lessive (Doing the Washing), and so on. Annoyingly, Brilliant have not tracked these little movements separately, which is a real nuisance if you want to pick one out. The same goes for the relaxed Carnival d’Aix for piano and orchestra, whose twelve movements follow - and for several of the other works on the CDs. Surely it wouldn’t have been too much trouble. Still that is a very small grumble; this is a valuable and enormously rewarding issue, all at under £10. If you’re missing other favourites such as La création du monde or Scaramouche, there’s another 2-CD set with those pieces on the same label, conducted by Bernstein and Prêtre. Brilliant is the word. rec. 1972 (Piano Concerto, Suite cisalpine, Muse ménagère), everything else 1968.